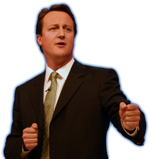 "They are fairly disenchanted with politicians overall, but Cameron is perceived as the best of a bad lot. FDs would probably give their votes more wholeheartedly to any candidate who had a credible programme for reducing red tape and easing the burdens on business." Imagine the lead if the Conservatives did unveil such a programme. Meanwhile, the Conservative STEM taskforce (science, technology, engineering and mathematics) have published an interim paper today advocating "innovation prizes". The idea takes inspiration from the 1714 Longitude Act - which offered the equivalent of £30 million for a way of measuring longitude accurately - and gives the modern example of a £10,000 prize to develop a new way of wave-produced electricity. Instead of subsidising firms to develop technologies, the taskforce (headed by former Conservative Science Minister Ian Taylor) believes government departments could offer a contract for the end product and leave it to companies to seek their own funding. People often hearken back to the innovative Victorian days, perhaps this kind of incentive-driven rather than grant-funded research is the way forward. A tory government could offer a number of bursaries tenable at leading universities to bring together a team of able young people for specific research projects, such as the next generation of fuels. They might even set up companies to turn the research into marketable products. Any successful company could, after a while, be privatised, with the caveat that the government should retain a majority stake for a few years to ensure that it was properly managed. Glad to see we're using Ian Taylor, MP. Ian was a good Science Minister and has written a number of sensible pamphlets, including one excellent one on corporate responsibilities. Working with Howard Flight, they do a fantastic job in winning over the City. Remove regulatory laws from companies that employ less than 20 people. Reduce Corporation Tax for all companies that increase employment. 20% growth or more e.g. 10 employees raised to 12, corporation tax 0%. 5% growth, corporation tax 22.5%. This would persuade more companies to grow, create jobs, be able to finance their own growth, reducing their borrowing requirement. fast growing companies are cash hungry and suffer from cash flow problems. They often end up selling shares, or going bust. Many lose control one way or another. Often they cannot cope with the regulatory burden and the costs of complying as they grow. If tax was adjusted to help more companies to risk going for growth, the country's tax take would surge. There would be more jobs. Our economy's productivity would go up, enabling an overall rise in everyone's standard of living. Cameron doesn't deserve any credit with business - he who pays Steve Hilton £276k for part-time brainstorming, and spends his time advocating Hitlon's other clients as a bonus. The way Cameron promotes 'ethical business' is itself unethical. A prize of £10,000 seems a bit pathetic for discovering a way to produce electricity from wave power if the Longitude Act gave the equivalent of £30m. That said, it's an excellent idea, very popular in the past when Britain was most innovative. Brunel won the contest for the Clifton Bridge, Stevenson the £500 contest for best steam locomotive (Rocket). It's incentive driven and much better than grants, which are very hard to deliver effectively. I recall Frank Whittle was rejected a grant for his jet engine, and many early computer researchers likewise. Bring on the contests. Could use that £78 million TfL advertising budget for prizes! A prize of £10,000 seems a bit pathetic for discovering a way to produce electricity from wave power if the Longitude Act gave the equivalent of £30m. The Committee awarding the prize under the Longitude Act were very picky, there was a lot of internal political rivalry on the matter and they tried to get out of awarding the prize saying that it was impossible that any other method than astronomical methods could work, and then they tried only paying half the prize and in the end it was the King who went over the heads of the Board to ensure that the prize was granted, it was something of a mess really. Pure research tends to get rather ignored these days, a lot of things that originally were thought to have no practical use later turn out to have a great deal of use. Reducing Income Based Taxation will avoid penalising people for the rewards they reap from their inventions, in addition focusing more on R&D, Military (a lot of technological development has been either military in origin or been developed by military orientated organisations), a lot of the problem is that manufacturing has been allowed to go out of the country so the inventors go out of the country and the inventions are made out of the country, things such as train building and design, aircraft building and design. These ludicrous bureaucratic PFI projects need to be stopped, trends of social spending since the turn of the 20th century have to be reversed - a stronger economy with a strong military and security services, low taxation, low private sector regulation and with the public sector taking a very utilitarian ideas based approach not flinging ever larger amounts of money on Personal Healthcare and the Arts, in people's own health the most important thing is not the NHS it is rather good transport links, good air and water quality and access to food, information, knowledge. If we want to get anywhere as a nation, we will have to unpick all those awful education policies that the lefties espouse. Abolish all the mickey mouse subjects. Give some sort of incentive for taking up physics, chemistry math etc. If we dont, companies will quietly decamp to somewhere like China where the kids are good at it!!! Also, repeal that ruling that says one can drop modern languages at 14!! Once folk have made their pile, and are buying that nice little place in Provence, they are trooping to french class!!! Why drop it in the first place?? Zut Alors!!!! There is no role for government in "picking winners". Why cannot Shell and BP and oil companies do this ? Why subsidise the richest corporates on the planet ? Which University has such expertise ? Do you think we should import Japanese and German, Brasilian and US scientists for this research ? Abolish the National Curriculum. Make top universities independent. Educational standards will rise. No need for politicians to do anything. The message from business to all politicians and lawyers should be to f*** off out of the way. Business would work perfectly well if government didn't exist. Property rights,the law of contract, Common Law is all we need. Unfortunately that's what we're losing to European Law. Government picks a winner every time it awards a contract. That aside, it's definitely in the public interest to be able to influence research towards strategic objectives. I like the idea of prizes. It's far better to pay on results than to create or pay research organisations, like NASA, that consume the public purse. "If we want to get anywhere as a nation, we will have to unpick all those awful education policies that the lefties espouse. Abolish all the mickey mouse subjects. Give some sort of incentive for taking up physics, chemistry math etc". Absolutely correct, but one mustn't forget English as well, Annabel. The CBI has just attacked the government for the woeful standards of literarcy and numeracy of so many young people joining the workforce, as well as graduates with no or few relevant skills. Against this reality check, we have to accept from the exam boards that the continuing rise in standards, year on year, does reflect real improvements. This is a puzzling contradiction and I tend to go with the independents which are moving away from A level to the IB and from GCSE to the IGCSE, which is more challenging. Prizes and incentives for acheiving a specific result are a far better way of influencing the direction of research and innovation, but it doesn't have to be limited to government nor do the rewards have to be massive. The Ansari X-prize was only worth $10 million, far less than a lot of the competitors spent on their entries but it managed to stimulate a whole new, commercial race for space. And there wasn't a government agency in sight.